LEIGH coach Paul Rowley wants his players to do themselves justice as they start the Super 8s as one of the teams most tipped to shake up the Super League. The Centurions have been the stand-out team in the Championship for the last two years and now have a seven-game series against the top-flight’s bottom four to earn themselves promotion. Having beaten bottom club Wakefield in the Challenge Cup expectations are high, but Rowley just wants his men to do their best, starting against Hull KR on Saturday. “What I’m hoping for is that our players who have been consistent for two years can do themselves justice in this next phase, regardless of the outcome and results, and showcase what we’re about,” Rowley said. 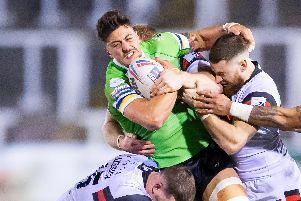 The Centurions have not lost a home game in over two years and if they can start out with a win over Challenge Cup finalists KR will give a real signal of their ability to make the grade. “It’s a big challenge, we understand that,” Rowley said. “But we’ll just enjoy the challenge of competing with some wonderful players. “Hull KR for me have been the darlings of Super League. They play a good brand, so we’ve got two teams playing good brands and it’s going to be an exciting game. Hull KR bring passionate fans as well, so our place is going to be rocking. “We’ll try and get a result in each and every game we play. Obviously that will be difficult. Wembley-bound Rovers are in the unusual position of being in with a chance of lifting the cup but also being relegated. Hit-and-miss form in the Super League cost them a top-eight place, with their best displays reserved for the cup.